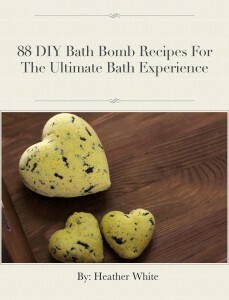 This is an e-book filled with deluxe bath bomb recipes. They are fun to make and only require a few ingredients that you may already have at home. Bath Bombs are great, but the ones you buy at spas and department stores often contain chemicals that are actually dangerous to your health. Homemade bath bombs are safe to make for even women with sensitive skin. Learn how to customize the way your bath bombs look and smell with this amazing e-book! I write a blog that is dedicated to teaching people how to live healthier. I was inpired to write this book because I know there are hidden synthetic ingredients in store bought bath bombs and many other beauty products. I thought that this book might be able to help someone choose a safer and healthier alternative. 1. Combine baking soda, cornstarch, citric acid and epsom salt. 2. Stir the dry ingredients until mixed. 3. In a separate bowl, combine coconut oil, vitamin E oil and lime essential oil. 4. Stir with a wooden spoon until blended. 5. Very slowly, drip the wet mixture into the bowl with the dry ingredients. 6. Wearing a pair of latex gloves, mix the ingredients with your hands until it feels almost like damp sand. 7. Pack the mixture into the mold and let them sit for a few hours up to overnight. 8. Remove the mixture carefully from the mold and set it aside on a towel to continue drying for 24 hours.